My plan to cook a blog-worthy meal failed. To replace my cooking post, I am going to share with you my favorite trends for this spring and summer. With SXSW in town, there has been some great people watching! Trends that I have loved seeing around town are the NEONS, PASTELS and FLORAL PANTS! I decided not to photograph the randoms who I saw wearing these trends. Instead, I found some pictures online that resemble some of the street trends I loved! Below is a look from J.Crew that is so cute! I love the chambray shirt paired with neon pink shorts! Gap has large variety of pastel-colored jeans that I suggest you check out if you want to be "in" this season! 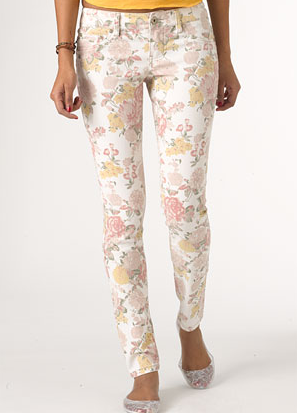 If worn right, I love both of these pastel-colored, floral pants! I doubt this trend will stay around which is why I posted two versions of almost the exact same pant. One is significantly cheaper than the other so I would be hesitant to splurge on something so trendy!